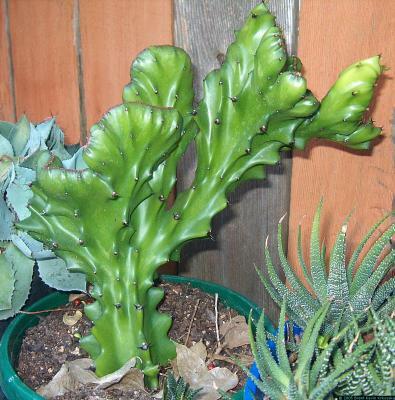 A Euphorbia is not a cactus, despite their similar appearance. This is a case of "convergent evolution", where a family, genus or species is not related, but develop similar characteristics in response to similar conditions. The Euphorbia genus can be thought of as an "African cactus", but it's a cactus in the human mind only. Euphorbias evolved in African deserts, cactus evolved in American deserts. In both cases, the genus is still evolving, which gives us a wide variety of looks and styles in an individual species. This particular plant, like most plants, should be green, but a collector at some point in the past found a white stem that he propagated, and a sub-species is born! Euphorbias are normally active during the warmer months, when they are tolerant of lots of water, and dormant during the cooler months, when they can do without water. In winter I stop watering completely. When it starts to warm up, I start watering, and within a week to a month, I'll start seeing new growth from the terminals. I've found that if I don't water when it starts to warm up, the Euphorbia of any species will just sit there, doing nothing, until I DO water. Very handy for tight spaces or if you just like the look and don't want to change it, because an occasional down side is that new growth may not be as symmetrical or just not seem to match the old growth. Euphorbia lactea in particular, unless it's in full sun, tends to thrown out lopsided branches, where one branch on one side grows a lot and a branch on the opposite side just sits there like a lump. Like all Euphorbias that I know of, it has a caustic latex sap that flows heavily during it's active growth season. If it gets on your skin, wash it will soap immediately or it will look and feel like a burn. Painful. I take cuttings in the late spring. I've found its easiest to use a hacksaw blade, otherwise the tough woody core of the stem may get hacked up and give fungus an opening. Goggles are advisable because you do NOT want the sap to get into your eyes. Wash the sap off and set it upright on the ground until the sap stops flowing, then let the cut end dry on a shelf out of the sun or keep it standing on its stump in full shade. They do best planted in a potting mix with lots of perlite, sand or pebbles, but any well-drained soil will do. Protect them from freezing temperatures until they're as big as a house or you risk damage to the margins, if not the whole plant. This form is called different things by different people, including crestate, cristata, crested, even monstrous, monstrosus...probably other things along those general lines. Care is the same, cuttings as easy to propagate in the same ways. I've seen these grafted onto Euphorbia stock, but I don't think there's a biological reason for it; botanical hobbyists are just an unusual bunch who like to experiment.